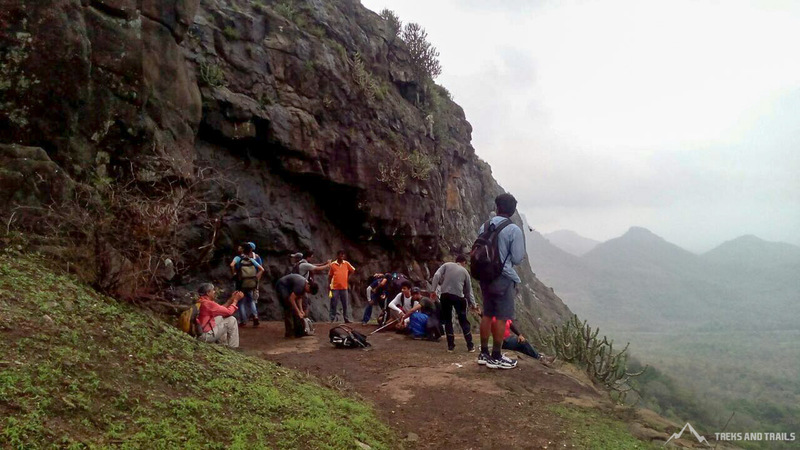 So finally the day had arrived for Asherigad Fort Trek. As it was a trek on the western side it was decided to use the public transportation local trains and tum-tums. Waking up early we all boarded the Dahanu local from our respective railway stations and our trek leader Prashant came from the central line and all 17 of us met up at the Palghar station. We all had breakfast and tea and we all were up excited and enthusiastic to reach the base village and start the trek. We boarded the taxis and in about 30 min reached the base village Khodkone. As we started our trek from the bus stop on the national highway 8A. Treks and Trails our trekking group from Mumbai gave us a briefing about the place. We crossed the river bridge and met up our guide Lakshman in the village. Then the most interesting part of the trek the introduction happened in which we got to know our fellow trekkers engineers, pilot, Uganda and various other enthusiastic trekkers. 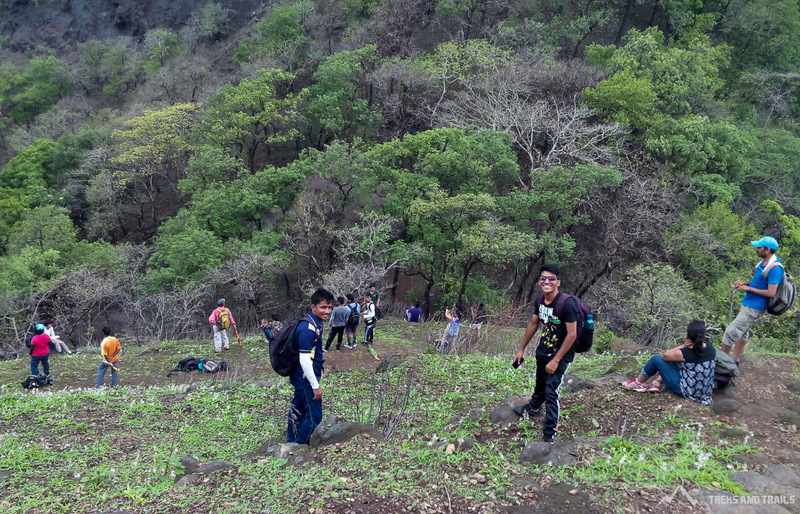 Then we were all boosted up to reach the top. 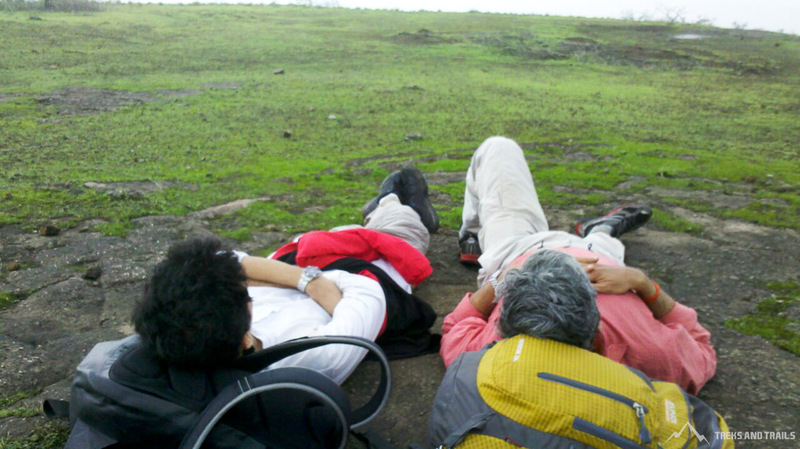 With Prasant as the lead Poulomi in the middle and Avinash as the tail we were all set to stand atop Asherigad. As we passed through the village and the jungle which was easy and not so tiring then we kept moving on and praying and hoping for some rains and winds as we all were literally sweating and worn out. 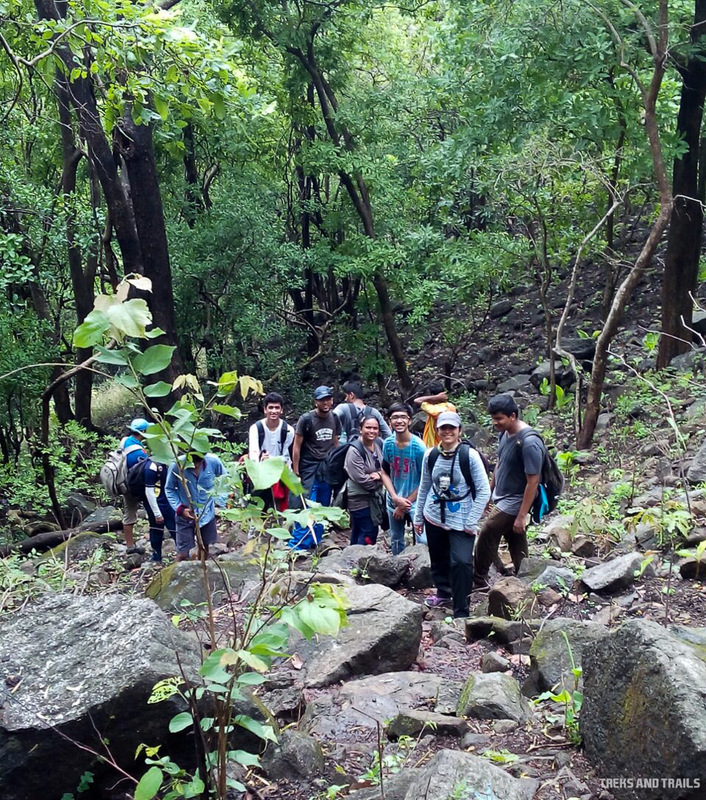 We kept on taking breaks at regular intervals, shared a good laugh at various times mimicked Nana Patekar and crossed the jungle part and came up at the rocky patch just before the ladder. As we progressed we took pictures and selfies to get the maximum of likes. We then crossed near by the 30 feet tunnel and then came the ladder. As we crossed the ladder there were some ancient stones kept depicting Gods and their valour. 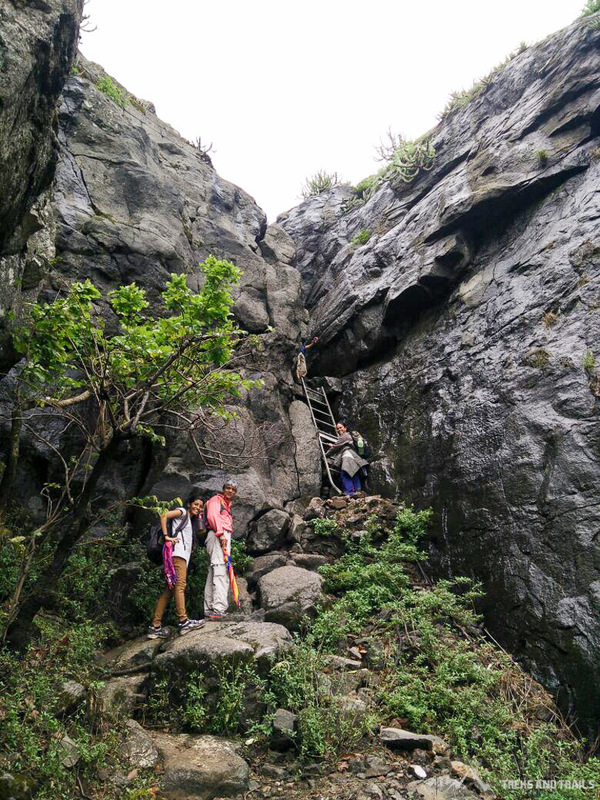 We carried on further and passed through open plateaus and steps. 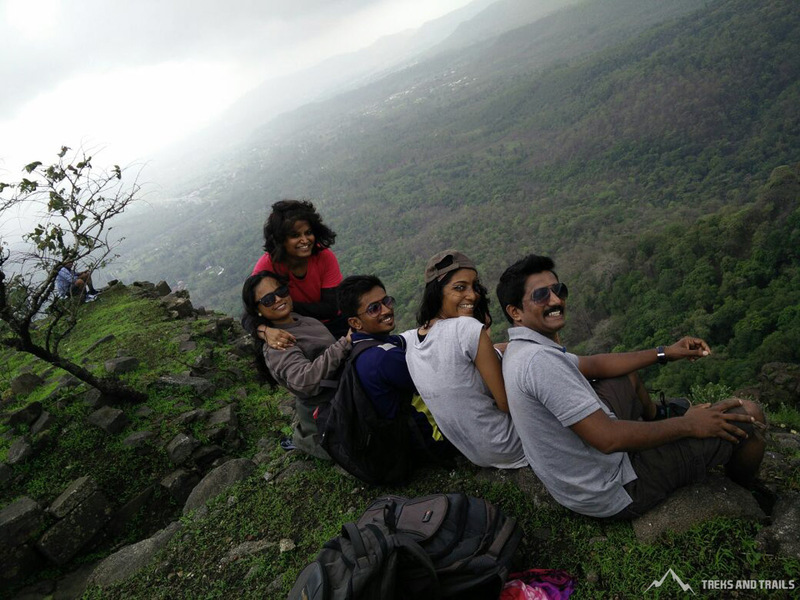 We then reached the temple of lord hanuman and we finally were atop Asherigad literally on cloud nine. The atmosphere and the surrounding was just astonishing and pleasant. We all had our lunch of bread rice puri bhaji and mayonnaise and took some rest and then begun again. And then we departed to visit the 2 ponds or small lakes in which there were lotus or water lilies. Then finally our prayers were answered and Indradev showered his blessings in the form of rain. Then we all were beaming and joyous and a different spark was evident on each one’s face. Then we went to the potable water cirsten filled our bottles with the aromatic water and started our descend from Asherigad. 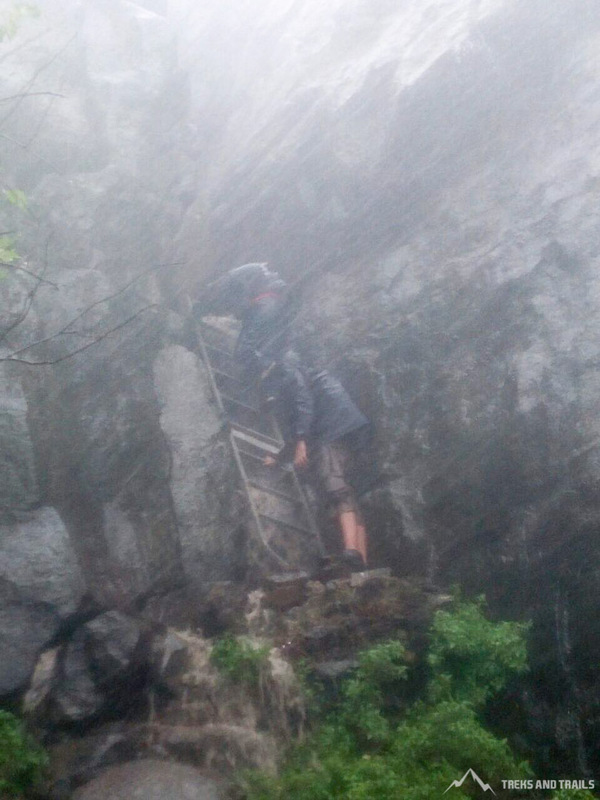 While marching down the ladder the wind and the rain hitting the rocks just mesmerized us. 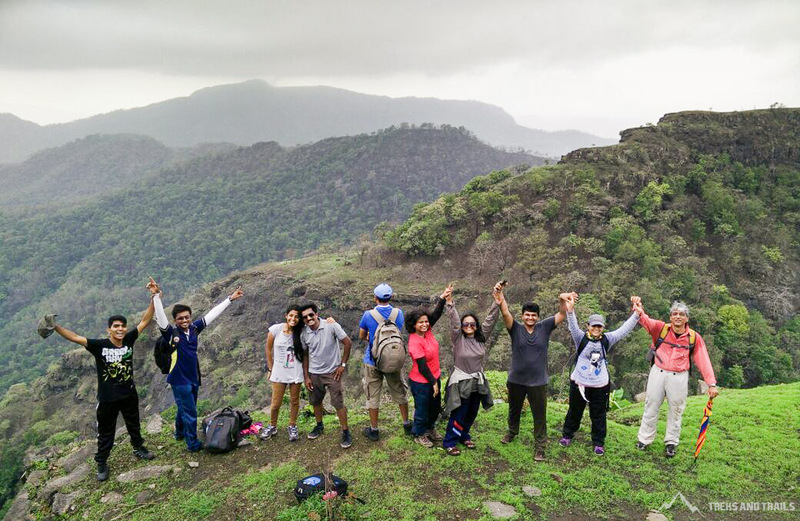 With rains the descend was even more invigorated and we all were charged up and energized. We completed the descend with a single break and all of us were exhilarated and ecstatic. We then had black tea which tasted just awesome and we moved ahead to enjoy in the river at the base. We enjoyed ourselves in the river and waited at the base bus stop for the taxis to pick us back up to Palghar. We discussed about various other treks while in the taxi and reached Palghar station to catch the 6:10 Churchgate local back home. We boarded the train and the trek ended with the sweet memories. Thank you each and every one of my fellow trekkers to make this trip wonderful and thanks you Treks and Trails India for organizing such treks. You guys are just awesome and rocking.